Hydrogels represent one of the most important classes of biomaterials and have been widely used for drug/cell delivery, tissue engineering, and disease models due to their biocompatibility and biodegradability properties. Traditional bulk hydrogels often suffer from drawbacks such as limited injectability, lack of control over morphology, and low cell adherence. Therefore, hydrogels engineered via innovative biomaterial chemistry and biofabrication technologies aim to overcome these obstacles and hold the promise to translate hydrogel based therapy into clinical setting. This month we focus on three articles published in Biomaterials Science reporting the recent advances in engineered hydrogels as therapeutics, 3D printing platforms, and cell culture systems. Cell therapies via direct cell transplantation often resulted in limited therapeutic effects due to low cell viability and retention. Therefore, the authors utilized the platform technology of injectable shear-thinning hydrogel (termed as SHIELD) to mitigate such problems. SHIELD consists of engineered recombinant protein and polyethylene glycol modified proline-rich peptide domains, and it promoted cell-matrix interaction to improve cell viability and retention. Additionally, SHIELD was further strengthened by thermoresponsive poly(N-isopropylacrylamide). The encapsulation of human induced pluripotent stem cell-derived endothelial cells in SHIELD protected cells from membrane damage caused by injection and augmented cell proliferation under hypoxia. In a rodent model of peripheral arterial disease, cell injection with SHIELD had significantly higher cell retention in vivo and further promoted microvessel formation to relieve ischemic insult when compared to saline control. It has been well recognized that scaffold architecture plays a critical role in determining the cellular behavior. Tradition hydrogels fabricated by freeze drying, solvent casting, and phase separation were often confined to less controllable architectures. Utilizing 3D bioprinting via drop-on-demand (DOD) technique, the authors printed 3D hierarchical porous collagen scaffolds with finely controlled pore size and porosity . In this process, droplets of polyvinylpyrrolidone (PVP) were uniformly printed to facilitate the rapid and homogeneous cross-linking, enhance collagen fibrillogenesis, and tune the collagen architecture in a controlled manner. This printing strategy yielded a cytocompatible construct as demonstrated by a primary human dermal fibroblasts model. To improve the stem cell based therapy for the repair and regeneration of central nervous system, the authors engineered hydrogels which composed of polyethylene glycol, agarose, and polyacrylic acid with cell-adhesive and cell-recognition Arg-Gly-Asp (RGD) motif. 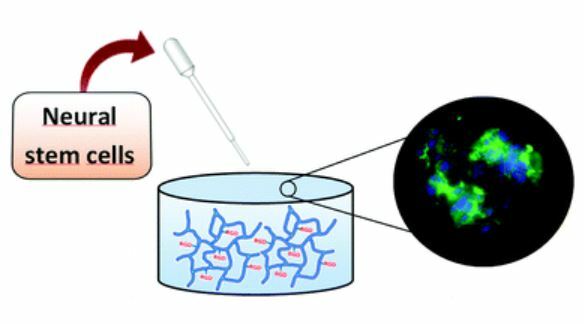 When interfacing with neural stem cells, the RGD modified hydrogels enabled a higher ratio of active proliferating cell population compared to a 2D laminin surface or non-RGD hydrogel throughout the 21 day in vitro culture. Additionally, the examination of conditioned media obtained from the in vitro culture revealed the higher level of nutrients contained in the RGD modified hydrogels group, indicating the superior biocompatibility of RGD modified hydrogel construct. Yingfei Xue is a web writer for Biomaterials Science. Currently, he is a PhD candidate and graduate student researcher in Dr. Shilpa Sant lab at the University of Pittsburgh, USA. His research focus on nano-/micro-technology in novel heart valve therapy. Find him on Twitter: @Phil_Xue or connect with him on ResearchGate.